Spike Albrecht’s final game in the Crisler Center will feature him wearing a Purdue uniform. Here’s what the former Wolverine had to say about his upcoming return to Ann Arbor. He is still playing college basketball. He now wears a Purdue uniform. He’ll be on the Crisler Center floor for Michigan’s Senior Day for a second straight season. Albrecht arrived in Ann Arbor in 2012 as part of the “Fresh Five.” Mitch McGary, Nik Stauskas, and Glenn Robinson III were all selected in the 2014 NBA draft; Caris LeVert has since joined them in the league. And yet here’s Spike, after getting a medical redshirt last season, still ballin’ in the Big Ten. Wearing No. 55, he’ll be back in town with the first-place Boilermakers Saturday afternoon. A two-paragraph refresher on Albrecht’s Michigan career: The baby-faced, floppy-haired point guard backed up National Player of the Year Trey Burke as a freshman, providing steady ball handling, passing, and outside shooting. Despite single-game highs of 15 minutes and seven points, he scored 17 points in the first half of the national championship against Louisville, draining deep threes when Burke was benched for foul trouble. Albrecht famously tried to capitalize on his overnight fame by tweeting at supermodel Kate Upton. He was a key player off the bench as a sophomore, when Michigan won the Big Ten regular season title and reached the Elite Eight. As a junior, he battled hip injuries but gutted out 31 games and 18 starts for a team playing without LeVert or Derrick Walton for the final dozen games. Albrecht needed hip surgeries following the season, and eight games into his senior year, he shut it down. Albrecht and LeVert were in suits last March for a depressing Senior Night. Now at Purdue, Albrecht is averaging just 1.8 points and 1.3 assists in 12.8 minutes. He has taken only 35 shots this season and is 4 of 22 from three-point range. The Boilermakers are 23-5 (12-3 in the Big Ten) and ranked 14th in the country. Albrecht has enjoyed his new coaches and teammates. He exchanged a few texts with John Beilein earlier this season and speaks regularly with a few of his former Michigan teammates. In fact, he Facetimed with Walton and Zak Irvin last night. They shared a laugh before the season when they saw the schedule put Purdue in Ann Arbor for Michigan’s final home game. “The crazy thing about it is he’s probably going to get as many cheers as we are,” Walton said. As of yesterday afternoon, Albrecht said his coaches hadn’t tapped him for intel about Michigan’s tendencies. When asked about coaching against a former player, Beilein said, “That’s one of my concerns, in this league, about transferring within,” before later adding that Purdue’s Matt Painter has coached against Beilein enough to be familiar with Michigan’s preferences. A year ago, it seemed unlikely this would be an issue. Albrecht had essentially announced his retirement from basketball, but he continued to rehab throughout last season. As Michigan navigated through the postseason, Albrecht gave serious thought to a return. Purdue had an open spot, and now Albrecht is playing for a team that Beilein believes can win a national championship. He knows this: His basketball career will be done. “I won’t be trying to play overseas or anything like that. I’ve maxed out. I’ve gotten pretty much everything I can out of my body.” Albrecht, 24, refers to himself as old and says he still deals with occasional pain. 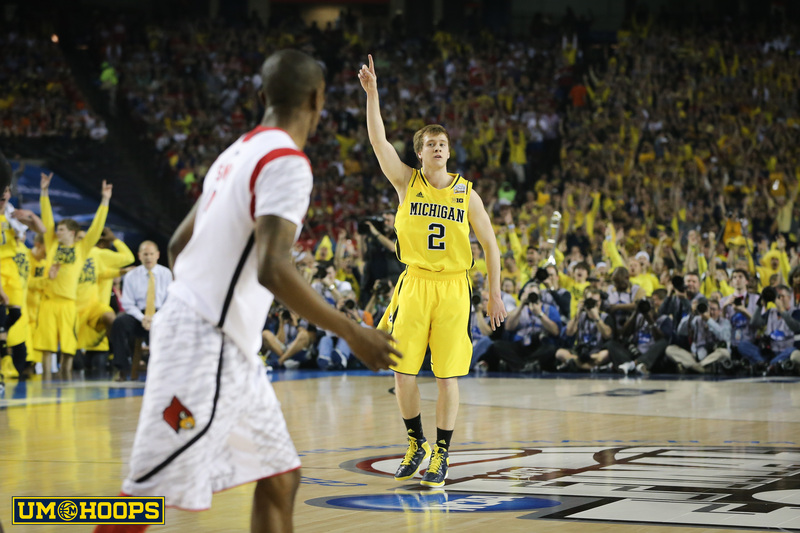 Michigan fans will remember Albrecht’s career for how it began, not how it ended. In the locker room before the 2013 championship against Louisville, Beilein told his team, “There’s somebody in this room that is going to be an outlier in this game.” Despite the heartbreaking loss, it’s hard not to smile at the memory of an unheralded freshman coming off the bench and lighting it up while firing up his teammates.